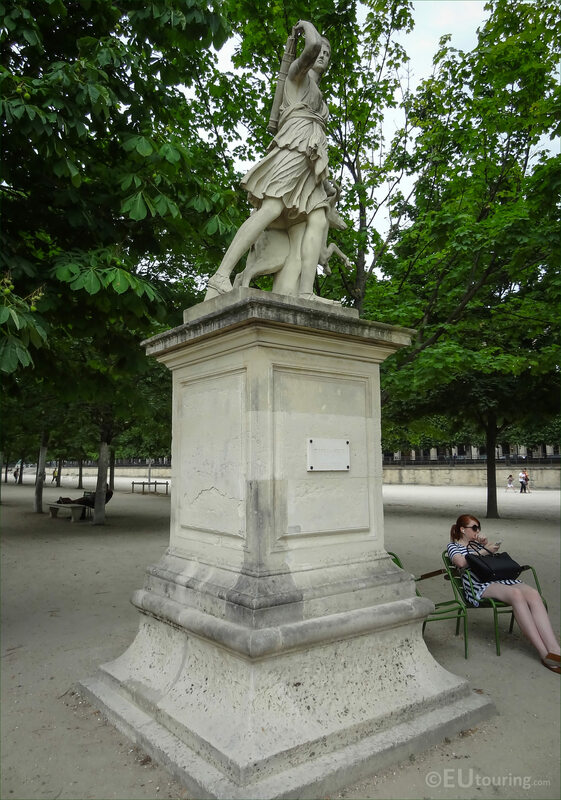 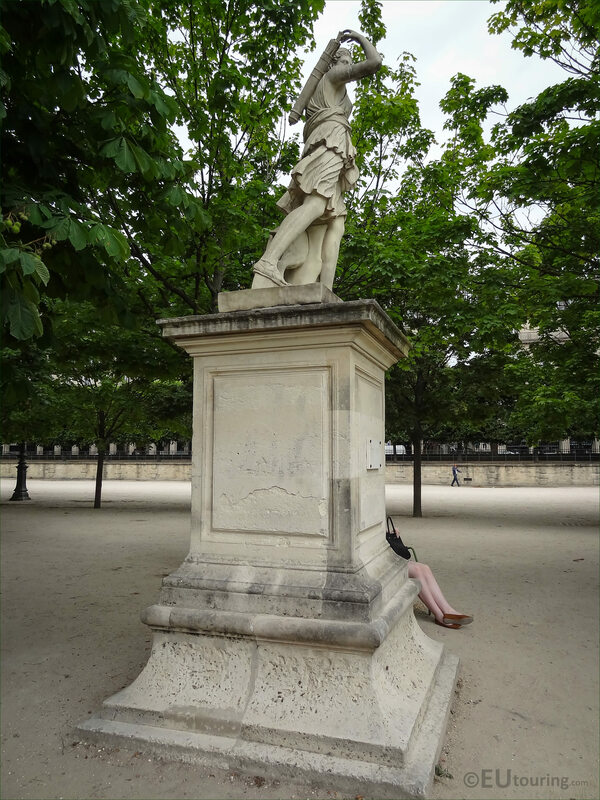 Again we were at the Jardin des Tuileries in the 1st Arrondissement of Paris when we took these high definition photos showing the statue called Diane a la Biche, which is an ancient statue by an unknown artist. 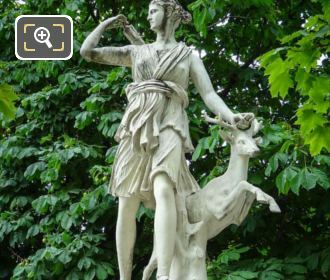 This first HD photo shows the statue called Diane a la Biche, which in English translates to Diana with a Doe, yet this is also referred to Artemis a la Biche, as Artemis is a Greek Goddess and is the equivalent of Diana in Roman mythology, who was Goddess of the Hunt. However, this statue is also sometimes called Diane Chasseresse, which means Diana the Huntress or even Diane de Versailles, and this last name refers to the mistress of King Henri II of France, due to the subtle yet inescapable likeness to Diane de Poitiers. Now this statue was a Roman copy of an original Greek composition originally attributed to Leochares produced in around 325 BC, but the Roman copy was from around the 1st or 2nd century AD, yet was only rediscovered in Italy in the 1500s and this then became the property of Pope Paul IV who gave it to King Henri II of France in 1556. 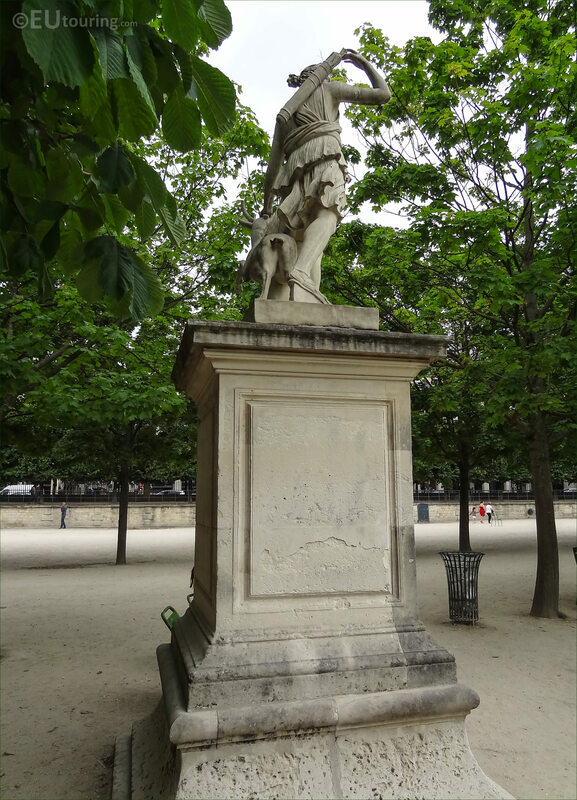 So this was one of the very first ancient statues to arrive in France and initially it adorned the Jardin de la Reine at the Chateau de Fontainebleu, but in 1602 King Henri IV moved it to the Palais du Louvre and after having been restored by Barthelemy Prieur, it was placed within a purposely built room called the Salle des Antiques, which is now called the Salle des Caryatides of the Musee du Louvre, yet a bronze copy was produced for Fontainebleau. 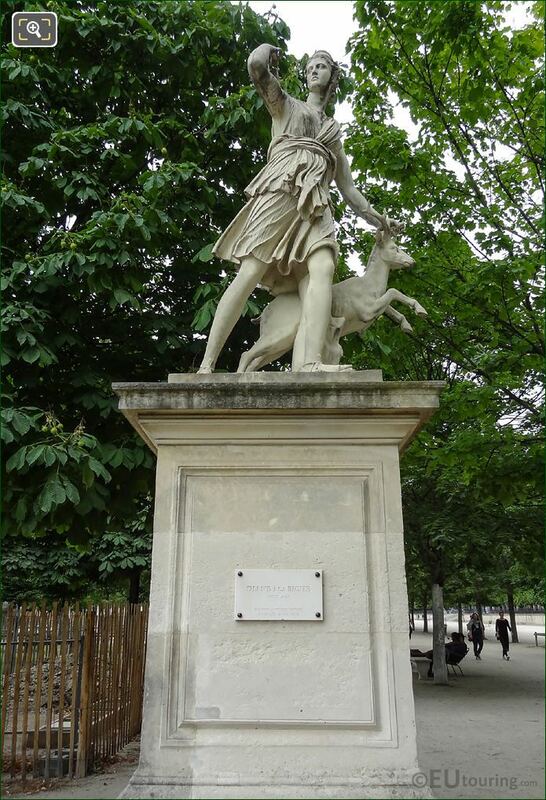 However during the reign of King Louis XIV the statue of Diana a la Biche was then transferred to the Chateau de Versailles within the Grande Galerie also known as the Hall of Mirrors and a marble copy was also produced for the Marly castle, but this was returned to The Louvre in 1798 under the First Republic by the Order of the Convention, being classed as one of the great historical treasures of France. 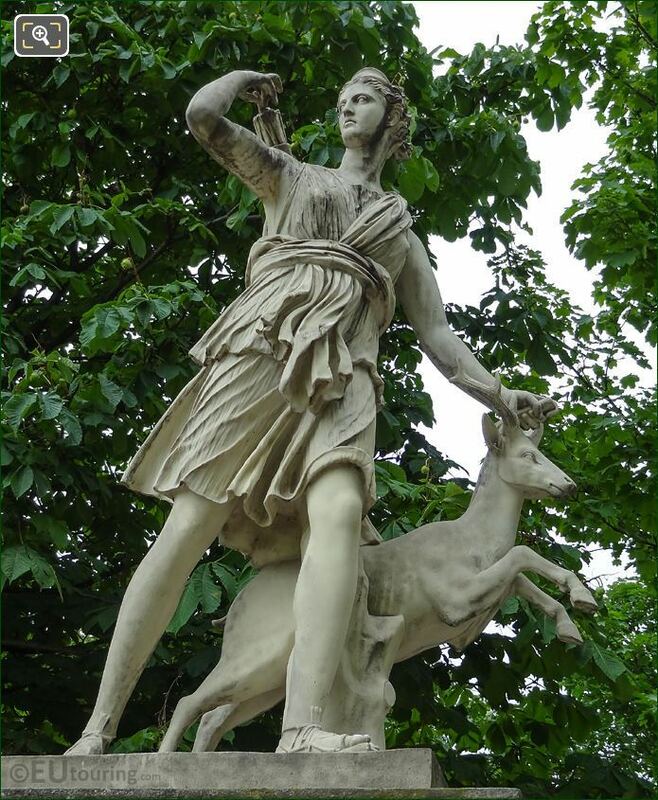 But the story does not end there, as in 1808, this antique statue of Diana with a Doe was restored yet again by Lange, during the reign of Napoleon Bonaparte and is today still held within the famous tourist attraction in Paris of the Musee du Louvre under the inventory number MR 152 within the Department of Greek, Etruscan and Roman antiquities. 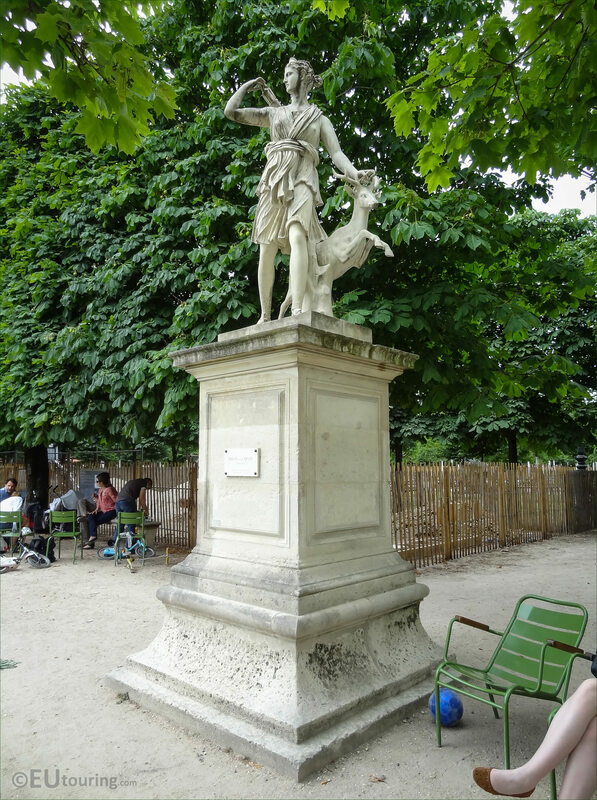 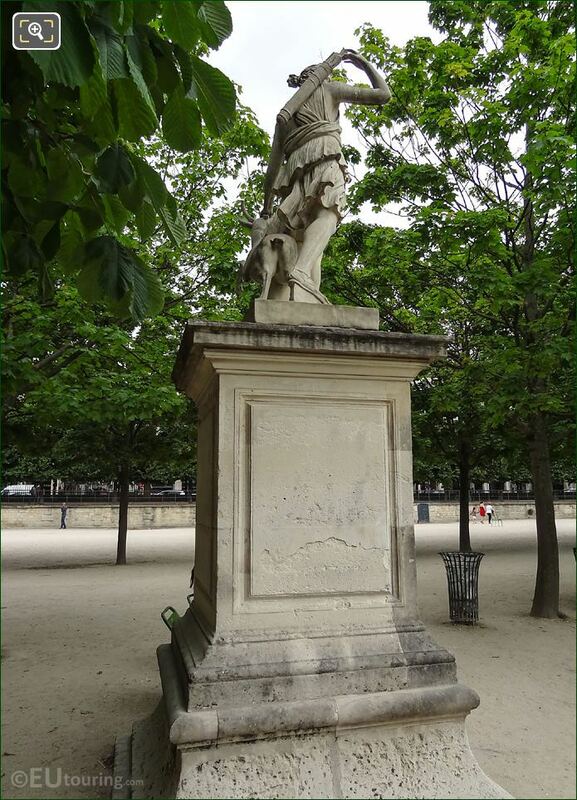 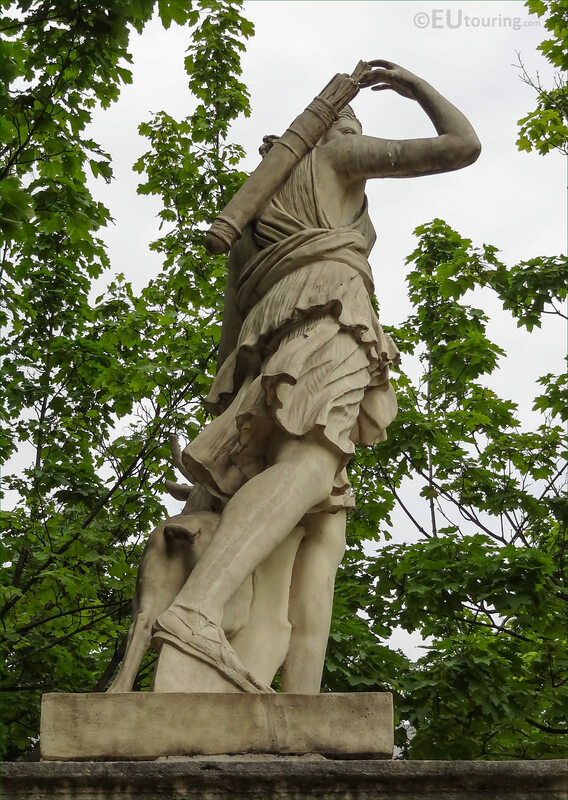 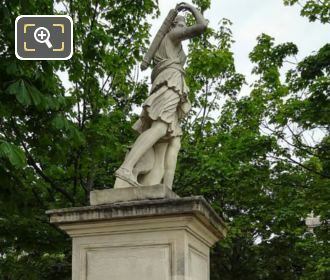 Therefore the statue you can see in this photo showing Diane a la Biche, also referred to as Artemis a la Biche, is a moulding, or copy of the historical statue you have just been reading about, which has been placed within the Jardin des Tuileries for everyone to enjoy for free. 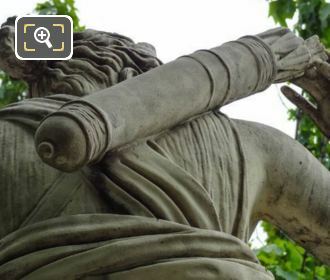 Yet this photograph shows the detailing of the statue including the deer from behind, and portraying the Roman Goddess of the Hunt Diana, who even from Greek mythology as well as Roman mythology has always been portrayed wearing a tunic style outfit called a chiton, which was worn in ancient Greece, although normally longer, but hers was short due to hunting. 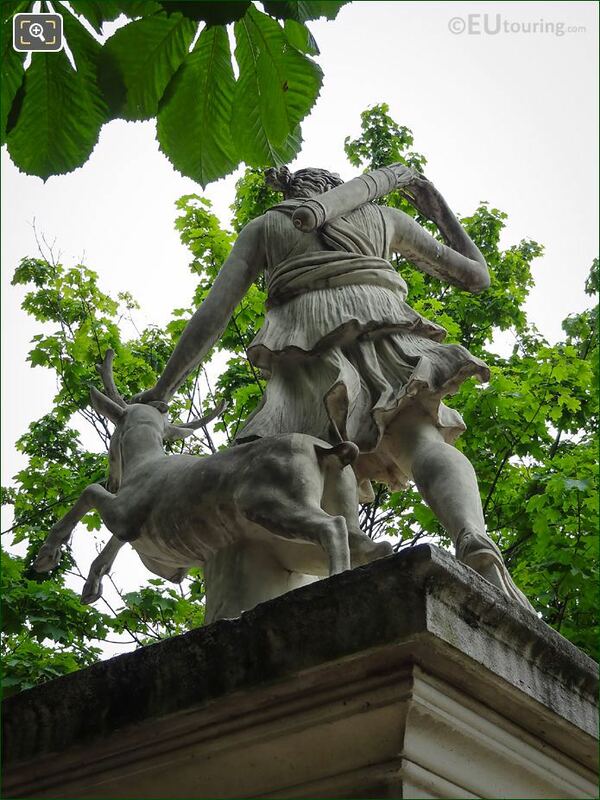 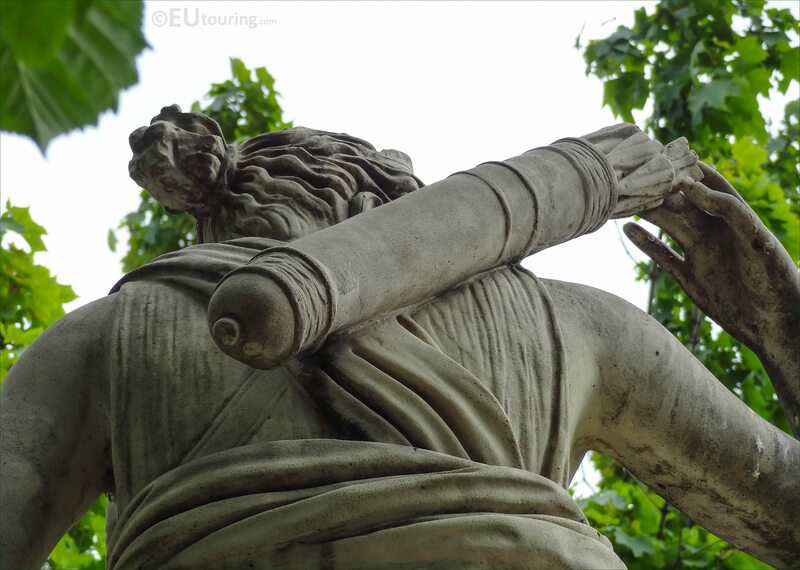 And in this close up photo you can see the quiver on the back of Diana, Goddess of the hunt, which is designed to hold arrows, and as you can tell, she is reaching and pulling one of the arrows out in readiness of preparing for a kill. 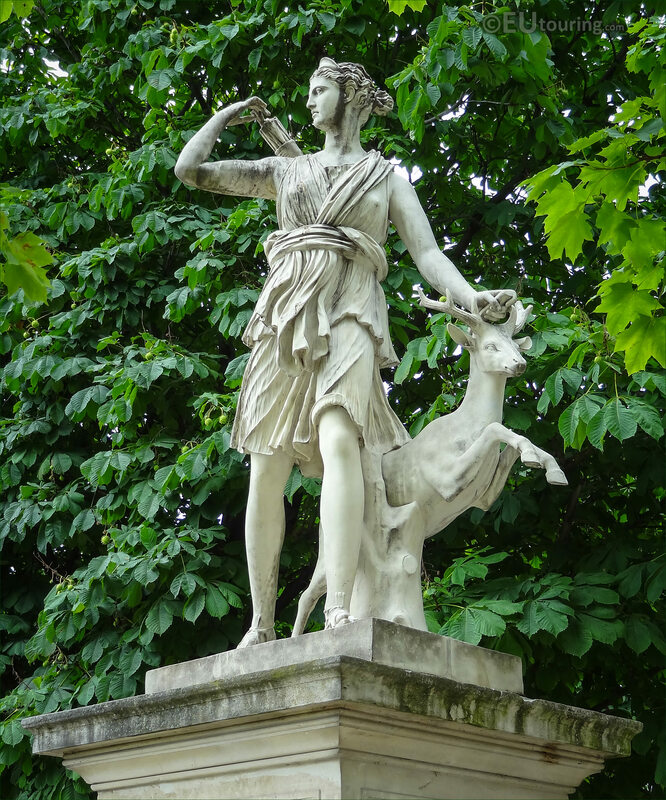 So Artemis a la Biche, the Greek Goddess of the Hunt and Chastity and any of the other names that this statue is referred to, is just one of the many copies that have been made from the original, and one can still be seen at the Fontainebleau Palace, which has been accompanied by two dogs to depict a hunting scene, so even if you cannot see the ancient statue within the Louvre Museum, you can get a feel for the scene it depicts. 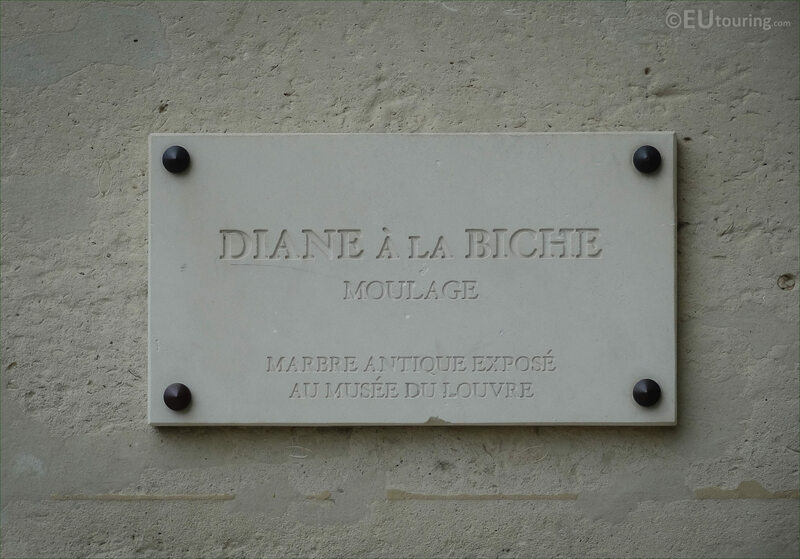 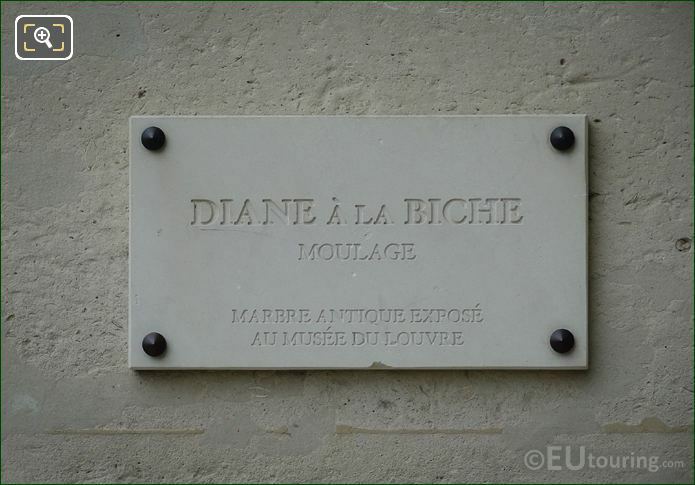 But this last photo shows a close up of the plaque, which has the name of Diane a la Biche, or Diana with a Doe, and also states that this is a copy or moulding, which is moulage in French, and the original antique marble statue is held within the Musee du Louvre, yet in the museum documentation this gets called Artemis a la Biche dite Diane de Versailles, which translates as Artemis with a Doe called Diana of Versailles.